I was interviewed by WRAL’s Bruce Mildwurf today. 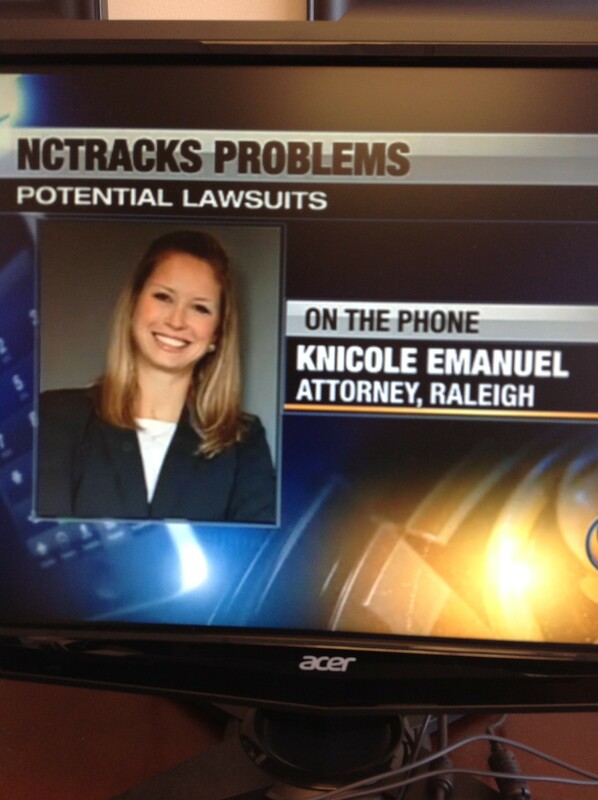 Be sure to watch WRAL at 6pm for the NCTracks story to air. Meanwhile, also see the Channel 9 Charlotte story that was aired a couple of days ago. VERY IMPORTANT: YOU MUST REGISTER FOR FRIDAY’S PHONE CALL IF YOU ARE INTERESTED IN THIS LAWSUIT. Thank you so much for coming to the presentations on May 11 in Durham and June 1 in Charlotte. We had a great turnout at both and most attendees have confirmed they plan to join in the multi-party lawsuit against the state. To view a copy of the original presentation, please click here. On Friday, June 14, 2013 from 12 noon to 1:00 p.m., we will hold a teleconference call for health care providers interested in joining the suit and learning more about the next step. To sign up for the teleconference, please click the Register Now link and enter your information. Once we receive your registration, we will email you the dial-in information directly. To date, we have approximately 30-40 interested health care providers, so we are close to our goal of at least 40! We will continue to add interested providers to this case up to 30 days after our teleconference. Therefore, you have from June 14 to July 14 to register and join in. Registration for the multi-party lawsuit will close July 14. We look forward to moving forward with this lawsuit to seek monetary damages for all the providers. Thank you and please contact me directly if you have any questions! NC Medicaid Audits: Are There Legal Grounds to Recoup Monetary Damages? Speaking Engagement! 05.11.2013 12:00pm — 2:00pm (Lunch will be provided) To register, please contact referral@ahbpsych.com. Guest Speaker will be Attorney Knicole C. Emanuel of Williams Mullen Law Firm. Ms. Emanuel focuses her practice on Medicaid Law and has assisted providers in navigating Medicaid investigations and audits. Lunch will be provided so please RSVP by Thursday, May 9th at 5pm to referral@ahbpsych.com.